No other time is celebrated in as many different and sophisticated ways all over the world as Christmas. And the same holds true for our musical perceptions and emotions, which are shaped and influenced in the most distinct ways. 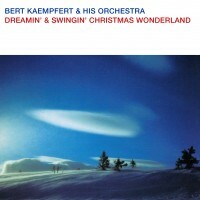 In 1963, Bert Kaempfert transformed the typical cheerful and carefree North American rhythms he loved so much into his unique and swinging sound with his Christmas production CHRISTMAS WONDERLAND. During the past, the original album CHRISTMAS WONDERLAND was succesfully published several times under different album titles and with various covers. In the same year as the Christmas production, Bert Kaempfert arranged and composed some other songs so as to add to the festive mood of a musical journey during Christmas time and end with strong emotions and Bert’s version of Sentimental Journey. This is how the original album CHRISTMAS WONDERLAND has become the present album DREAMIN’ & SWINGIN’ CHRISTMAS WONDERLAND.